Channeling my inner-Jamie! Picture on the right compliments of The Letter 4 + 1. This is very unlike me, but I'm doing a What I Wore post (also known as WIW). 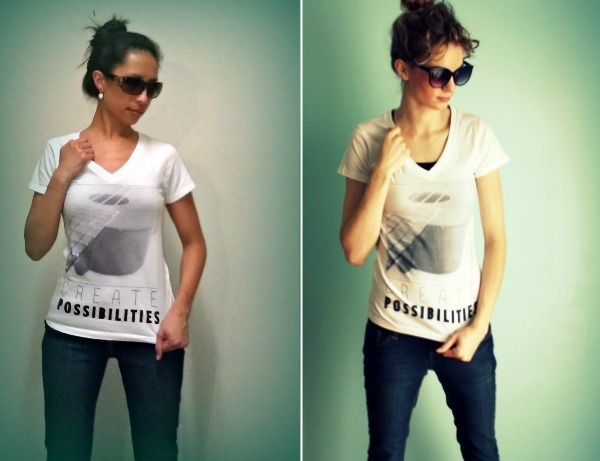 Although I don't do fashion posts, I really want to show off my Create Possibilities shirt from The Letter 4 + 1! Have you heard of them? The team includes The Letter 4 sisters and Jessica Nicely. It's an amazing concept! 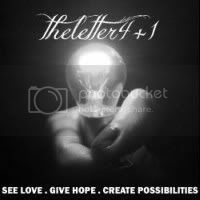 "The Letter 4 + 1 is a charitable company that provides hope and support through uplifting stories and by donating proceeds from inspirational products sold to benefit: childhood diseases (See Love), child abuse prevention (Give Hope), and a unique monthly cause (Create Possibilities). Another big part of our goal in operating The Letter 4 + 1 is to make lives a little lighter and brighter and to celebrate amazing people and their amazing stories. See our Be Inspired page to read some of those amazing stories. And if you have an amazing story of your own, or know someone who is worthy of being recognized, please drop us a note at info@theletter4plus1.com." The coolest part is that they donate 100% of the net proceeds to charity! They are not a non-profit. They simply want to give to others. That is goodwill at its finest! If you haven't seen their shop or read their stories, please take some time to indulge in the inspiration. It's incredible! what a great cause. and 100%?! love it. Fun! I'll have to check it out! you look gorgeous!! We love you to PIECES Lindsay...I mean no stachelinds, I mean Jordan godia!!!! You're looking fabulous - but that's not a surprise! I need to check out this blog NOW. Oh wow! Never heard of this but it sounds awesome! Definitely speaks to me as a social worker! Excited to check this project out a little more. Great pic btw! How cool! Checking them out now, lovey.